So…life lately. I’ll be honest, 2018 did not get off to a great start. A younger cousin passed away, my sweet pup Pucci needed bladder stone surgery and I came out of the holidays with a general malaise and pronounced lack of drive. By late January I finally was able to motivate myself to start cleaning out some closets. It’s a task I’ve done for a number of years now so most rooms are in pretty good shape. It’s usually just the kitchen, bedroom and bath that need a bigger clean out. The main drawbacks are that it takes a considerable bit more time. I now rough fold my laundry into the basket to bring it upstairs and Kondo fold once in my room and ready to put things away. Also, for some things like my predominantly black/grey workout wear, it can be very hard to tell what is what. For t-shirts it’s phenomenal and I’ve actually been wearing some of the ones that used to get buried at the bottom of the stack under my old method. For an overview on the Kondo folding method, check out this video! As the next improvement, I purchased several of these Real Simple Honeycomb Drawer Organizers. Again, you see a lot more of what you have than using the stack method and it is much easier to keep things tidy and in order. 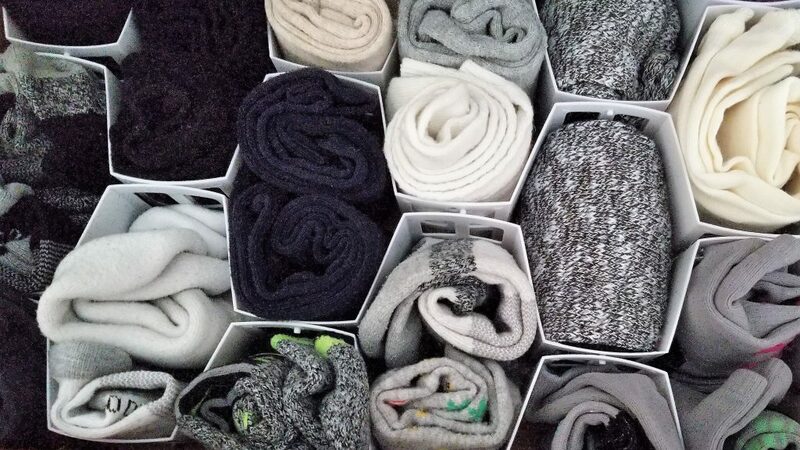 I’m currently using the honeycomb organizers for socks and undergarments. While I have a jewelry box and necklace tree for frequently worn pieces, I also store quite a few things in my lingerie chest. 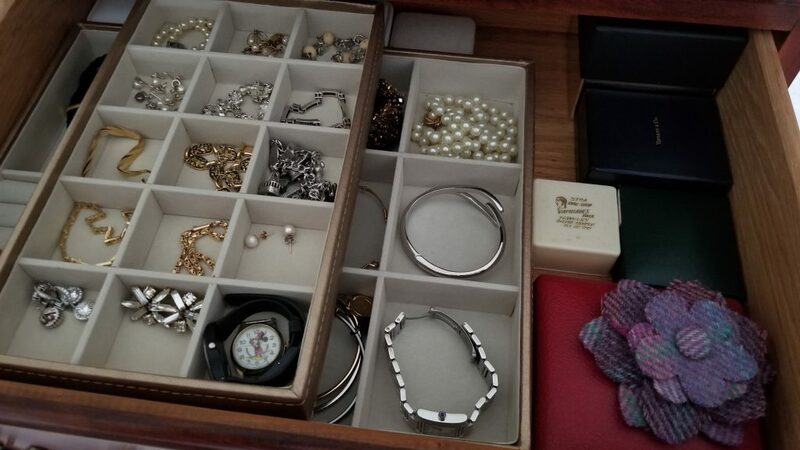 That too had started looking a bit cluttered and chaotic so I purchased a couple Ampersand Stackable Jewelry Trays. Now everything is on display and easy to find! 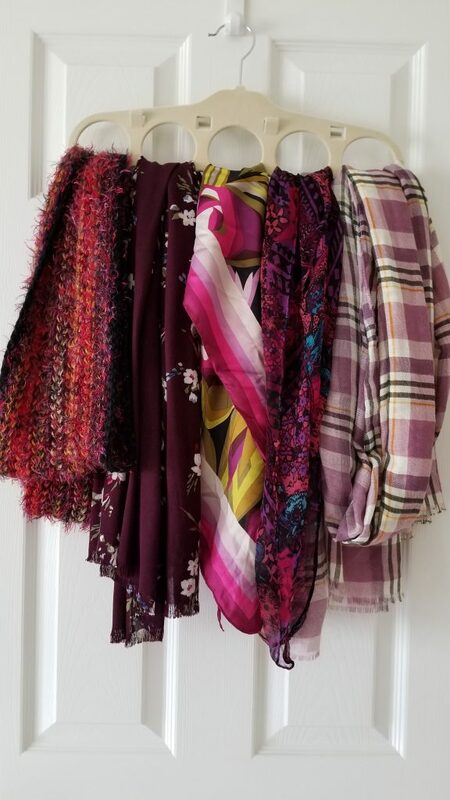 I’ve always stored my scarves on hangers but this year bought a couple Real Simple Scarf Hanger that have specific slots for each scarf. 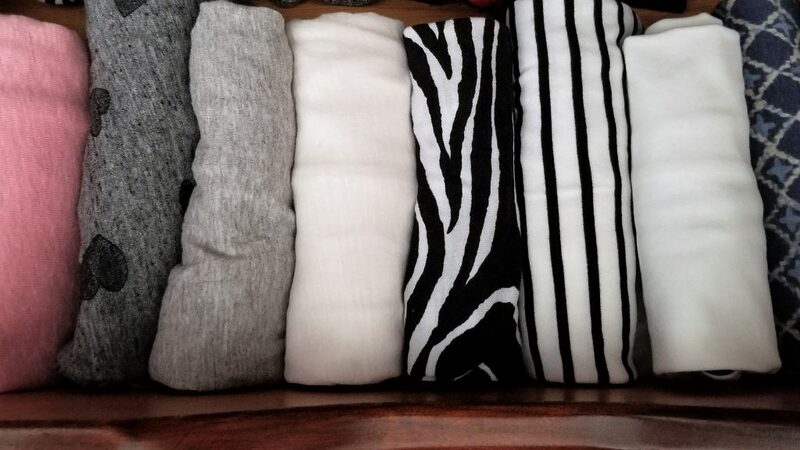 It’s easy to arrange them by color and is much more convenient than folding. Several years ago I began ditching shoe boxes (unless they’re a really, really expensive pair) and started storing my kicks in a modular shoe organizer. 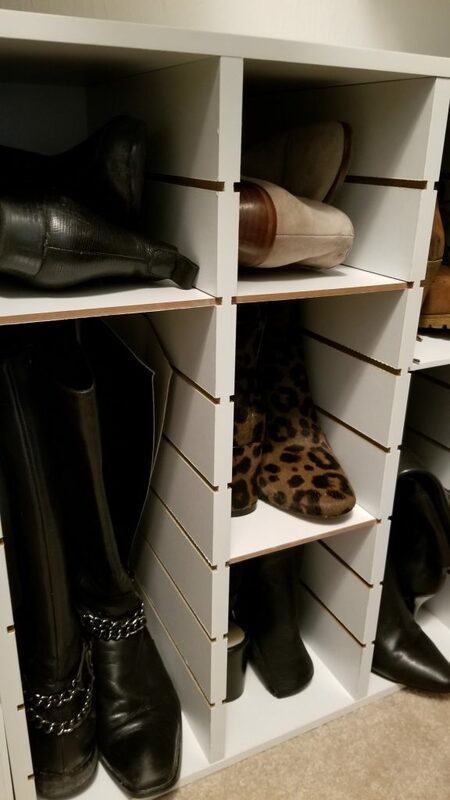 My original organizers had fixed cubby holes that didn’t work for boots but this fall I found this adjustable Real Simple Shoe Organizer. Love how easy it is to accommodate anything from flip-flops to OTK boots! 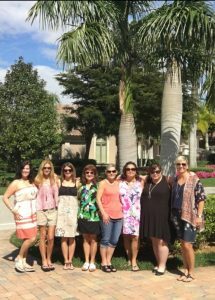 Last weekend I enjoyed a trip to Florida with some girl friends and it really filled my tank! We enjoyed some great meals, had a few drinks, spent time in the sun, laughed ourselves silly and did our part to bolster the South Florida economy! Hopefully spring will be here soon. 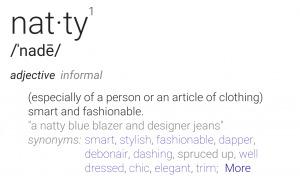 Join me next week as we look at resort wear for 2018! Forever Fierce Day – February 19th! Have you heard about Forever Fierce Day? 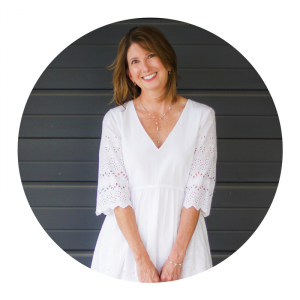 On February 19th fifty midlife bloggers are joining forces to share the stories of 100s of women and what it means to them to be Forever Fierce in midlife and beyond. Be sure to join me in checking out some of these posts on Monday! Elizabeth, I am so sorry to hear of your rocky start to the new year. Hopefully, things have started to turn around for the better. And Spring is definitely on the horizon. I know that helps me! I have used this Kondo folding method (although I didn’t know it had an actual name!) and I found it quite effective, too. Until we moved and my dresser would in no way fit up the stairs and is now in my living room housing a multitude of toys! 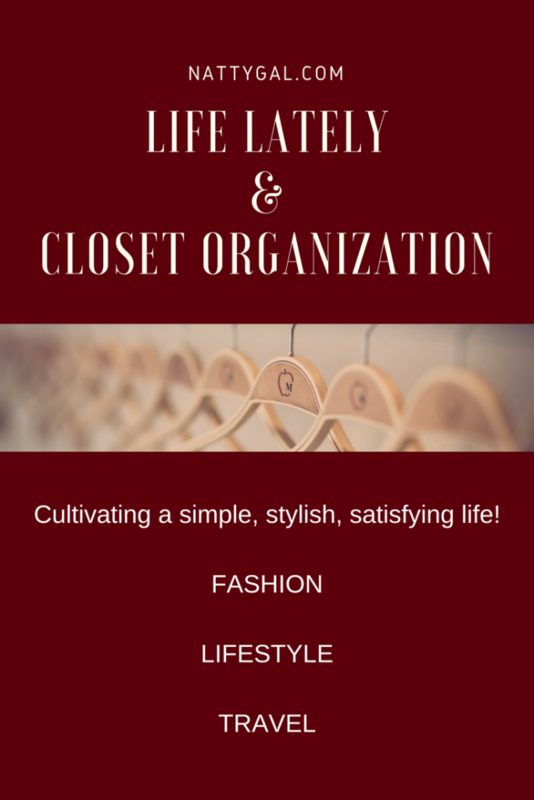 I need to do a major closet overhaul but I am way too overwhelmed by the contents to even begin! But if I get around to it, I am really loving your ideas. Thanks so much for sharing! Darn those stubborn furniture pieces that won’t get up stairs! Ha! Yes, it was a rough start but steadily improving. Thanks for the concern and have a super weekend! my closet is in dire need of an upgrade. 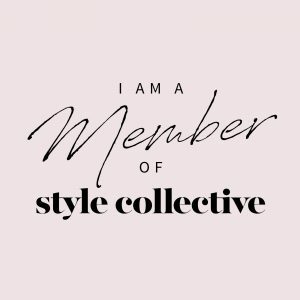 I love your recommendations for jewelry and scarves! Thanks so much, glad you found the post useful!